Situated only 85 km from Cape Town, Pringle Bay is a charming coastal village on the famous Whale Route. Pringle Bay beach is pristine and spotless and never crowded, even over Christmas! There is a small lagoon with clear warm water where the Buffels River enters the sea. The village is surrounded by mountains on three sides and overlooks the Ocean. You will find an interesting mix of young and old, South African and overseas residents. Pringle Bay’s attraction lies in it’s Virtually Zero Crime status, its position and beauty, affordable properties with low rates & taxes, 8 restaurants, clean unpolluted air and being part of the World Biosphere Reserve no further development. … Read the rest. Pringle Bay is named after the Royal Navy Commander-in-Chief Sir Thomas Pringle. The Pringle Bay / Pringlebaai area is full of history! Khoi Khoi, shipwrecks and the World War 2 radar station against German U-boats …Read the rest. Pringle Bay on the Whale Coast has long been dubbed the cuisine capital of the Overberg! A leisurely Sunday drive on the famous Whale Route, a walk or swim on Pringle Bay beach and then be pampered at a selection of 7 restaurants. … Read the rest. Pringle Bay & surrounds offer beaches, lagoons, water sport, restaurants, entertainment, Hiking Trails, Penguin Colony, Whale Watching, Boat Launching facility, Kogelberg Biosphere reserve, Harold Porter Botanical Gardens, Golf Courses, Wine Farms, Arabella Hotel/Spa … Read the rest. provides quality primary school education, pre- school & after care facilities + a nursery program. CLICK LOGO. Only one violent crime in Pringle Bay the past ten years, an incident between a resident and a person well known to her. Pringle Bay is certainly one of the safest villages in South Africa. There is only one entrance into the village, a CCTV and License Plate Recognition system is fully operational and an effective armed response company serves the community! … Read the rest. Bird Watching & Nature Walks, Ladies Club • Water aerobics • Nia • Tai Chi • Yoga • Pilates • Walking & hiking • Fishing • Social evenings • Art classes • Karate • Fun-o-cise • Callanetics • Painting • Life Entertainment on weekends • Volunteer fire, medical and security response teams…. and more … read the rest. In 2014 TRAVEL GURU voted the Wale Coast’s Clarence Drive 1st place as the most beautiful coastal drive in the world! This road follows the spectacular thirty mile stretch of coast between Gordon’s Bay and Pringle Bay along what is known as False Bay. …Read the rest. Cape Coastal properties and living in harmony! Viele Deutsche, Östereicher und Schweizer in Pringlebay! Durchschnittlich 300 Sonnentage im Jahr und wenn in Europa Winter ist, dann ist am Kap Sommer. 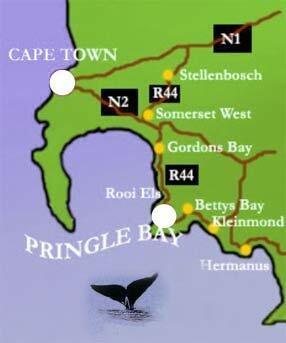 Der Pringle Bay Strand und die Lagune sind auch űber Weihnachten nicht űberlaufen und Pringle Bay und alle umliegenden Gegenden sind 100% sicher. NUR EINE STUNDE VON KAPSTADT! Click auf die Fahne. IMPORTANT Pringle NUMBERS> Police, Fire, Ambulance, Traffic, Law enforcement, Armed Response, Medical, Dentist, Vet, Pharmacy, Hospitals, Eskom, Municipality, fire team. > Restaurants, Guesthouses, Shops, School, Church, Conference Center, Builders, Hardware store, Laundry, etc. > Pringle real estate, houses and plots. … Read the Rest. Pringle Bay resident and Realtor Axel Maier 083 286 4144 deals with coastal properties and says that as limited development within the biosphere reserve is strictly enforced, Pringle Bay real estate close to Cape Town remains the Prime Investment opportunity. … Read the rest. This area is heaven for the bird-watcher as a large variety of birds can be spotted from the black-shouldered kite up in the mountains, to the Cape wagtail around the rock pools, and cormorants along the beaches. You may see Eagles, Sunbirds, Sugar birds and the African Black Oyster catcher. More than sixty species of bird have been spotted here! Photo taken by Axel Wallem from his South African holiday house in Pringle Bay. Only on special days does the sun set exactly at that point over False Bay at Cape Point. Click on photo to enlarge and also see Axel’s dolphins enjoying Pringle Bay beach. Life is good!